There are over a hundred thousand non-governmental organisations (NGOs) operating in the country that have, on the basis of levels of funding, been particularly active in health, education, good governance and social development. Many are members of the South African National NGO Coalition (SANGOCO). SANGOCO is the largest umbrella body of NGOs in the country and the whole of the Southern African region. 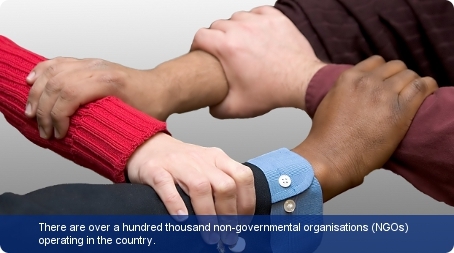 The most relevant legislation for NGOs and CSOs is the Non-Profit Organisations Act No.71 of 1997. The Act, a result of a long process of negotiations between the state and civil society, sets minimum standards of governance, accountability and transparency in the operations of non-profit organisations (NPOs). Under the Act, NPOs must register with the NPO Directorate within the Department of Social Development. For an NPO to register, its constitution must comply with various requirements set out in the Act. Registration is not compulsory, however it carries the natural benefit of credibility. The UK’s support through the Department for International Development (DFID) has aided the country in reaching its Millennium Development Goals (MDGs) through improving measles immunisation, skilled birth attendance and access to improved water sources. South Africa must maintain its role in the African continent’s development by ensuring these MDGs are met. South Africa’s trade unions are influential to the country’s labour market and industrial relationship policies. Unions are able to address relevant concerns of their members through the Labour Relations Act. Various debates on socio-economic and labour-related issues are undertaken during the National Economic Development and Labour Council (NEDLAC) meeting.